I “met” Shannon Pruitt from MyNewFavoriteDay at a Super Secret Underground Facebook Society. I still can’t even believe she noticed me. I mean Shannon is a machine. She has this super huge Facebook presence with sixty-four bajillion followers, but we started chatting and she asked to interview me for her blog. Whaaaat? Interview me? But that’s how Shannon is. She makes everyone feel noticed. Special. Recognized. Affirmed. Her goal is to have people recognize the most precious moments in their lives so that time doesn’t pass us by. She wants us to appreciate all we have in each day. And she succeeds. Like the sound of that? 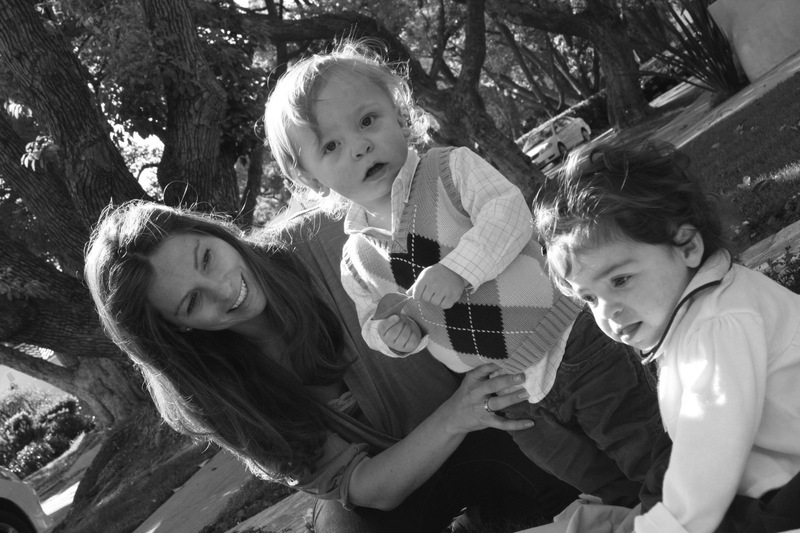 Read her blog and follow Shannon on Twitter at @newfavoriteday. Click on the teacher lady’s elbow to see other folks who have posted in this series! I remember Kelly Clarkson’s “Breakaway” was playing through the computer speakers when J came to sit down behind me. A look of concern had been the constant mask glued to his face as of late. I knew he knew something was wrong, how could he not know? He shifted my hair across my back and put his hands on my shoulders. I stared at the screen in front of me, scared to move, scared to speak. The words were there on the tip of my tongue. 3) You had to be in class 5 days a week, and I was already paying for school and working full-time. I choked on the lump building in my throat. “It’s us. We are what’s wrong.” I whispered. His hands fell next to his side. The words tumbled out of my mouth and I knew in my head and, in my heart, I wouldn’t turn back now. J was my safety net, a sense of home, a rock in what had always felt like a tumultuous sea of self-preservation. He stepped in, became a real love, a love that I could call home. When he asked me to marry him I was 23 years old, and we’d only been together for 6 months. He moved to Japan to be with me and we stayed there for another 18 months. When we came (to where) so I could go to graduate school, he went back to manage the restaurant where we had met. And I started to sprout wings. Little by little, year-by-year, my little bird-wings strengthened. And, with each year I flew slightly further from the nest, from home, from him. I was full of passion and excitement about life. J loved me so much, he would do whatever I wanted, go wherever I went, and love me no matter what. But I longed for life and experience. I wanted to fight with him sometimes. I wanted him to fight with me. I wanted him to fight for me. To tell me No! I couldn’t leave. Nothing was wrong with “us.” It was me. I could be happy with him, we just had to try harder. He did not say these things. He let me cry. He cried too. He let me leave. He let me walk away. I walked. Had I not, I wouldn’t have the wonderful life I have to today with my husband and children. In that moment, had he fought, perhaps the impetuous me could have been tamed for a little while, and the lesson could have been a different kind of growth. Instead, I reached out eagerly to a new experience 3,000 miles away in Los Angeles. Some days, I still miss the nest. But I am glad I followed my heart; for had I not, I would have missed all of this life. Have you ever had to leave someone you love to find freedom? It’s Mardi Gras & MyNewFavoriteDay! There are TWO awesome things about today. First of all it’s Mardi Gras, y’all. 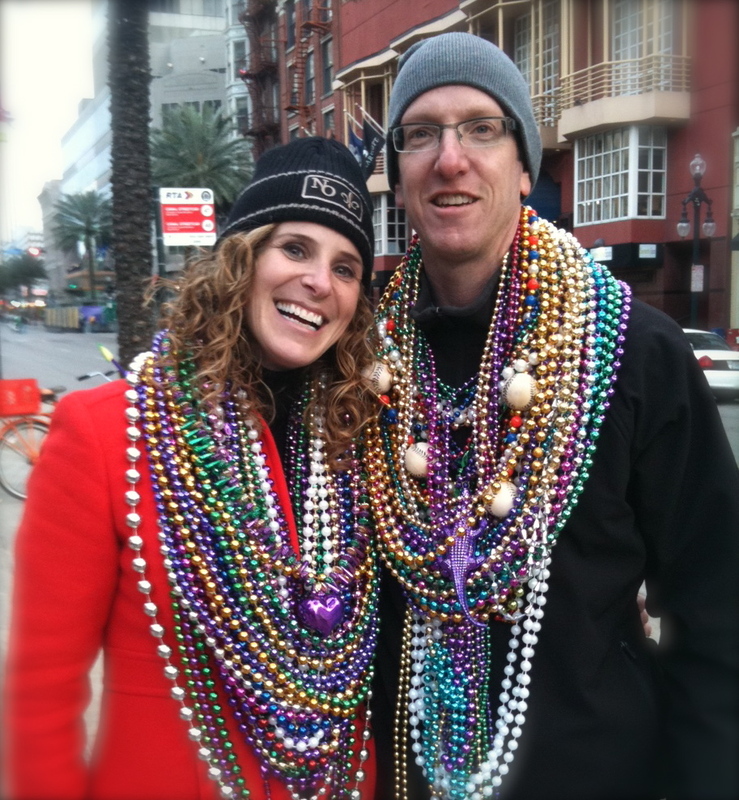 When I was in New Orleans with Lisha Fink (The Lucky Mom) a few weeks ago, I made it to a bunch of small parades, and — yes — I lugged home thirty-five pounds of beads. Why are you looking at me like that? Those things are like gold. Do you see that one I’m wearing with the purple heart? Yeah. That’s a really good one. And the baseball beads my husband snagged? Also, outstanding. There is definitely a hierarchy when it comes to Mardi Gras beads. I don’t wear just any old plastic beads. They have to be long and chunky. They have to shine. Does this sound crazy to you? I know. It kind of is. The thing is this: everything is topsy-turvy during Mardi Gras. Especially when it is a little dark outside and you find yourself jumping up and down in front of slightly scary looking masked people, begging them to throw you a little something. As far as I’m concerned, I came home victorious. Hubby & I looking fancy! And you know what else is awesome about today? I met Shannon at a Super Secret Underground Facebook Blogging Society. She has a huge Facebook presence — which is incredible, and I can’t believe she even noticed me! Shannon’s goal at her place is to have people recognize the most precious moments in their lives so that moments don’t pass us by so we can appreciate all we have in each day. You should totally follow her at @newfavoriteday. But for now click HERE and check out the fun interview she did with me. Do I sound like a dorkus or what? Tell me at Shannon’s place.